Storytelling is part of social action and interaction that actually shapes the future of organizations. 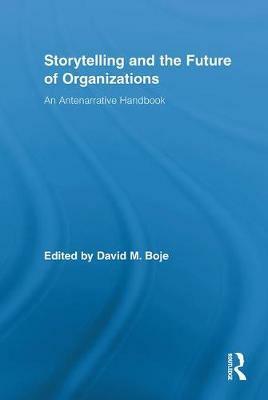 Organization and management studies have overwhelmingly focused to date on rational narrative structures with beginnings, middles, and ends, where narrative has proved to be a handy concept in qualitative studies. Far less attention is given however to the more spontaneous and `non-staged' storytelling that occurs in organizations. Storytelling and the Future of Organizations explores the science and practice of `antenarrative' because that is how the future of organization is shaped. Antenarrative is a term invented by David M. Boje in 2001, and is defined as a `bet on the future,' as `before' narrative linearity, coherence, and stability sets in. Antenarrative is all about 'prospective sensemaking,' betting on the future before narrative retrospection fossilizes the past. Antenarrative storytelling is therefore agential in ways that traditional narratology has yet to come to grips with. This handbook contribution is bringing together a decade of scholarship on `antenarrative.' It is the first volume to offer such a varied but systematic examination of non-traditional narrative inquiry in the management realm, organizing and developing its approach, and providing new insights for management students and scholars. David Boje is Bill Daniels Ethics Fellow, and Professor at New Mexico State University. His focus is organization storytelling and ethics. He has published 17 books (e.g. Storytelling Organizations, 2008, Sage; Critical Theory Ethics..., 2008 Information Age Press) and 124 articles (in Administrative Science Quarterly, Academy of Management Journal, etc).